What I thought was going to be a romantic summer novel turned out to be a short lived short story. This past Monday I went over to my lover’s house (I guess we can call him that), and we talked all night. We had a fight during the weekend, I wanted him to come with my friends to the club but he wanted to go to the movies, and watch Mama Mia. I told him no, and that I was going to go with my friends with or without him. So for this weekend (our first and last weekend) we went apart. It was not until Monday night that I understood why he wanted to spend so much time with just me. I though he was leaving in the beginning of August, but he’s actually leaving this Saturday. My heart was torn. I knew he was going to be leaving so I was prepared but now having him tell me that is was going to be sooner really dug a knife in my heart. For me two weeks seemed like an eternity, like we had all this time in the world to do all the things we wanted and still have time to relax, but a week? One week. He started telling me how we could make it work, relationship wise. He could come down one weekend and then I can go up and visit him the next. He said there are so many ways to stay connected without physically having to be close. This broke my heart, it truly did. I am those people that needs attention to survive. Don’t get me wrong I’m not needy but I like to feel the person I’m with, I like to be next to them, I like our skins to be touching, I want to feel their warmed, I want to look them in the eyes and hold them. There is no technology that can replace a physical person. Aside from all that, we meet new people in our life’s all the time. He’s going to be meeting new people for sure, new city, new job, new everything. I don’t want that in the back of my head. Always asking myself, who is he with? Who does he talk to? What is he doing? I can’t live that way. So I told him I couldn’t and I was sorry. He started crying as did I. It was the hardest no I have ever said in my life. After our emotions were clearer we talked about just being friends, I know it sounds cheesy but that’s what we did. We talked about visiting each other and staying connected yes, but not in a relationship kind of way. He’ll always be in my heart. I never connected with someone on the level that we did so I’m glad that he will stay in my life, and maybe is destiny and fate ever have a brunch date where they talk about us, maybe they’ll decide to put us on each others path again. It never seems to happen at the right time for me. If it seems like there is something good going my way then bam¸ life wants to pry it out of my hands. And it happens every single dam time. I met a guy yesterday. Yes, on an app, (shut your mouth and don’t you dare judge me). When he started talking to me it seemed that he wasn’t that into me. Then the conversation progressed ever so smoothly. Like we had known each other for a long time. We talked and and talked for hours without ever running out of things to say. He asked me what I was looking for. I said maybe a friend or a relationship. I described to him what I felt and what I wanted. He really liked what I had to say. The only catch this time is that he is moving 6 hours away because of his job. New promotion. Just my luck, when I find a cute guy that actually likes me back and is into me, he has to go and move away. The issues is that we really liked each other. So, I kindly accepted his jokingly invitation to go over, yolo right? He really didn’t want me to go because he knew we would catch feelings for each other. And it turned out that we did, or at least I know I did. I went to his house and we talked for maybe an hour or so outside. We then went inside where we continued our coversation. Again, talking to him was so easy, everything just came out of my mouth, my complete trust was his. We didn’t talk anything serious, just regular midnight talk. We even talked about the stars and what not, I know, very romantic. I felt like it was a fairytale, I was delighted. Then we went to his room and just watched Netflix. Suddenly we are holding each other. I was glued to his body and he was to mine. The smell of his body made me float to cloud nine and I felt like I was untouchable. I felt like right there at that moment, I was finally living my dream. Like all the wars and battles I had to go through in my life were all worth it because they had all led me to that moment. It was too good to be true and then I remembered he was leaving soon. I told him, “this seems like a movie. No, like a book. What would we call it?” He came up with really good names to name our future book. But then I said I Miss You Already. We settle on it without a second thought because it was such a heart breaking tittle. Its sad but it is what is happening. I am falling for him, I know he is leaving, but yet I want more of him. My arms still smell like him. I can’t get his face out of my head, his lips and even the feeling of him holding me in his arms. The way he laughs and jokes around are all ingraved in my memory. Even his cute little cat, Jasper. This definitely feels like one of those summer books I used to read about when I was younger. Boy meets boy, they fall in love and then one has to leave, then slam, broken hearts. But those always end with a happy heart warming ending right? So because of the well known fact that one day, I, myself, will be one of New York Times best selling authors (kidding, see picture above) I was thinking that I should get started by writing. No, I’m not going to college for English or literature, and no my writing is not the best, but hey, I’m a work in progress. And I believe in myself which is what counts right? I feel that during the course of this blog I have learned a lot. Like the difference between loose and lose. And also bare and bear. English is weird. But nonetheless I love reading it! I plan on creating another blog where I can publish short stories and maybe chapter books. One chapter per post of course. Maybe one day I can go to college get the education everyone so calls “a must” and know how to write professionally. But for now I have a blog. 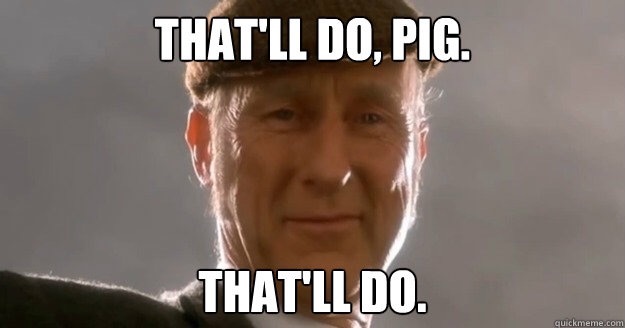 And that will do pig, that’ll do. I just love writing. And I don’t want to be working a scheduled job all my life. Writing a book is my dream. It would actually be a dream come true, and you never know, it could happen.